This week at New Monkey Studio I had the pleasure of recording D. on Darox and The Melody Joy Bakers. This rag tag ensemble plays a cornucopia of old-timey sounding musics: jazz, blues, latin, Americana and various popular song forms. Leader D.on has a strong gravelly voice that can whoop into a holler or come down low and slow. 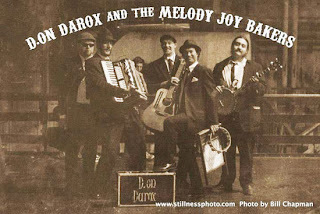 The Melody Joy Bakers play various instruments including accordion, guitars, drums, upright bass, piano, banjo, trumpet, theremin, washboard, and xylophone. It's nice to record a band that has lots of material that they have been performing live for years, but make no mistake the sound is loose and all about the feeling. They came into the studio, set up all together in the room and we cut every song live, then spent the next day picking the best tunes and mixing. Two days for a whole record, folks - that's the way it's done! In the meantime they'll be gigging around, trying to raise more money to master the album and make CDs and/or records to sell to their loyal fans. Probably have it released in the next few months, so keep an eye out for this one!